I am proud to be a member of the following clubs. Each of the logos will take you to their sites for wonderful sources of rattie information. Due to the recent outbreaks of the SDA and Sendai Virus,the RMCA has refrained from sanctioning rat shows in the hopes that this may help to halt the spread of the virus,and to protect our beloved pet rats.Please follow the graphic links below to read further information on quarrentine and events. Awareness is the key to safety. Logos used with permission of RMCA,RFC,RMCA So.Cal. 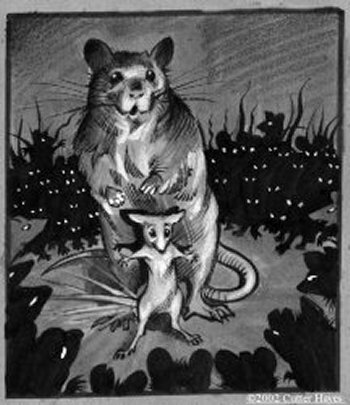 Mouse Knight drawing courtesy of Cutter Hayes, artist and author of "The Mouse Knight".